→How To Make Car Vinyl At Home And What Vinyl You Need To Use? ​Vinyl is a type of PVC that is used variably because of its flexible properties and ability to blend easily with other materials to create synthetics. It's a common feature in cars, and you may find it as a synthetic blend used to make your car seats, on your car windows as what we commonly refer to as ‘tint’ or on as branding on your company vehicle. There are two types of vinyl that are popularly used on car exteriors: Cast and calendared vinyl. Cast vinyl has got superior qualities to calendared vinyl and lasts longer though it is hard to tell them apart just by looking. For these instructions, we will use cast vinyl which comes highly recommended over calendared vinyl. This has risen to the top of the list over the past few years and now it is a very common practice to find cars partially or totally transformed by car wrapping. It's very common to see. This comes second on the list though used to be the main purpose individuals or companies would go for car wrapping. It is easier to print a design on vinyl and use the same on your car as opposed to creating a design on the car itself and using a variety of spray paints to complete the design on your car. However, the history of the art significantly traces itself to this function. Branding cars for advertising purposes attracted the attention of some creative minds to use the same idea for more personal aesthetic purposes. Few people use it strictly for this purpose but it is not uncommon to find someone’s car wrapped in vinyl that is the exact shade of the automobile’s original color in which case you would have to be told that the car was covered in a vinyl wrap. It is, however, a very clever way of protecting your car’s paint works. Any scratched or damaged vinyl is easily patched as opposed to a paint job which is much more elaborate and costlier. There are many brands of vinyl car wrap, but some of the top quality that comes highly recommended include 3M, Avery, and Oracal. These brands are relatively expensive but have exceptional relative quality compared to other brands. The quantity will depend on whether you want to wrap the whole car or just part of it. The usual size required to cover a standard vehicle is a roll measuring 60’’ wide and 25 feet long. It is however not advisable to get the exact measurements as some of it may get damaged, and there is no exact measurement to determine how much of it will go into ‘tucking in’ at the sides to give a complete job. This is the most important yet taken for granted part of the whole exercise. It is also the most time-consuming. Preparation involves cleaning your car using an alcohol-based solution to make sure all wax and dirt come off the car surface. After cleaning, you can now clearly see the other highlights that will require attention. This includes rusty patches, bubbles on the paintwork and other features that will cause the vinyl wrap not lie flat or may even damage the material. It is basically the same process as prepping your car for a paint job. At the end of preparation, every inch of the car should feel smooth to the touch. The working area must also be sanitized by eliminating any elements of dirt or dust. This equally means that the process must be done indoors; any element of dust that will come between the car surface and the vinyl wrap will be evident in the finished product. It will display in the form of tiny bumps in the car wrap. This again is similar to a regular paint job. Remove tail lights, headlamps, door handles, cargo carrier, bumpers; what you are looking to work with is strictly the body and nothing else. Removable parts that you want to be included in the exercise can be wrapped detached and reattached at the end of the process. This may seem very tedious but it is the only way to ensure strict uniformity in your work. If this instruction is not followed you will notice small patches here and there of the original color sticking out; it looks very unprofessional. The car body is not one continuous block. It is broken by windows and other parts. Take measurements of individual complete parts. Like the hood for example and cut your vinyl wrap to these specifications. You can label the various cuttings against a checklist to ensure you have the whole car covered. Make sure that no dust particles have landed on the surface. It is a simple process but could easily falter if keen attention is not paid to the process. If this is your first time, you will need a second person to help. This just to ensure the wrap does not stick together when applying or accommodate air bubbles. Now select your first panel and make sure you have clean hands before you proceed. Peel off the backing of the cast vinyl and apply it to the surface starting with the center and moving outwards. This is deliberately designed to eliminate air bubbles that may get trapped if you do it the other way around. Remember, an extra hand would be useful. Use the squeegee to press down the applied vinyl and ensure you use equal pressure so you do not stretch the vinyl unnecessarily. Work your way inward out. Once you are done with a particular panel, use the heat gun to check for air spaces you may have missed with your naked eye. Different makes of vinyl have different recommended temperatures for these purposes which are indicated on the role. You can also go online to verify the same. Next cut off the excess vinyl using the cutting blade but ensure you leave enough to tuck in. Remember the car should look uniform after you are done. Take care not to scratch your paintwork beneath as this would ideally require you to remove the vinyl which you cannot use again, repair the damage and start all over again. Avoid too much tension when tucking. It will cause creasing and consequently untidy edges. Remember any mishap at whatever stage can only mean removing the vinyl and starting the process all over. This is costly and time-consuming. It is cheaper to pay attention. setting the vinyl in place and revealing any faults. This is like a simulation to the outside environment and you can judge how the final product will behave once the car is out and running. Repeat any faulty areas. Now you are done. It was a tedious but rewarding task. Unfortunately, there are no shortcuts to this one. 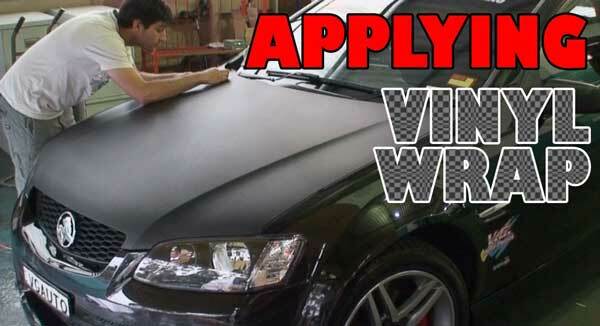 Anyone can apply vinyl car wrap at home as illustrated. It is cheaper and gives one the chance to give the car a personal look. Enjoy the experience. When you do this as a hobby, there will be no problem from the legal side. However, if you intend to sell these stickers and go fulltime pro, you need to keep an eye out for the legal and accounting sides. Different business regulations such as federal, county, and state laws should be kept in check. You need to keep track of your purchases, sells, profit and being able to ship your product in a timely manner is important. Keep a piece of stiff cardboard with you all the time. It helps to keep loose stickers and decals in the board otherwise the stickers and decals will get bent or get damaged during the shipping process. If you want to sell your work online, you’ll be needing a mini studio to make well-lit, beautiful and focused photographs of your work. Don’t take the extra hassle of learning photography if you're starting a new business. You already have enough on your platter, ask a friend maybe to help you out. Always prefer laminating sheets for protecting your vinyl stickers. It’s a thick material and does a great job of protecting your stickers from the water. There is a cheaper alternative to this. The acrylic spray is also a cheap way to protect your stickers. It won’t do a good job as the laminating sheet does, but you’ll get some sort of protection. 1. How to become a successful vinyl crafter? You need to passionate about what you can do and what you are good at. If you are passionate about vinyl cutting, turn this into a hobby and make some extra bucks while doing it. Over time, you’ll get the idea about this industry and how you can take this hobby into a profession. You don’t need to invest a lot of money from the start. Begin with what you have and advance further as you develop your skills. Keep an eye out for creative designs. Create as many mockups as you can, don’t worry about the quality, quantity is what will improve your skills. Also, if you are going full pro with this, remember to turn yourself into a brand. Be a people person. Go out there and talk with different people, see what others are hyped about, check out what is trending. Compile your designs is a creative way to do some promotional work. You need to let people know what you are capable of. 2. How do I make my own decals? You should make your own decals. It is a great way to replicate your favorite design. All you need to is gather the necessary materials, sketch out the design on a piece of paper, determine the number of contact paper then draw out the design on that to scale. Now, spread out the contact paper. The surface should be flat. Finally, cut your design with a utility knife or with sharp scissors. Another way you can do it is with a printer and a computer. Same process as the previous one. 3. Can you make car decals with a Cricut? Yes, you can make car decals with Cricut Expression. This is the larger version of the Cricut Personal Electronic Cutter and Cricut Create. You can use it to make decals for cars, scrapbooks, home, crafts, etc. You can also cut letters and shapes up to 12*24 inches. 4. Which side should you print vinyl on? Always print on the matte side. Think of the vinyl as a sticky paper. The shiny side the glued part and the matte side is the printable part. If you aren’t sure which way the right side, test with a normal sheet on a regular paper. After that, you can mark the top and bottom part with a marker in case you forget it again. 5. Which is better? Oracal 651 or 631? The most confusing vinyl on the market. Both of them are highly popular and also used for completely different applications. In short, the 631 is a removable matter, and the 651 is permanent glossy vinyl. 631 is temporary; the latter is permanent best suited for outdoor usage. The 631 is water resistant, and the other one is completely waterproof. Oracal 651 is mostly used for car decals, mugs, plates, glasses, cutting boards, etc. In short, car vinyl or stickers are the most cost-effective and versatile way to make your vehicle look beautiful. Whether you are looking to stand out from the crowd or simply love decorating your car, this DIY method will help you do that. Make bumper stickers with cool designs, windshield stickers to let the others know who is in town or make some extra cash; this skill is absolutely necessary. There is more than one way to make car vinyl at home; this is the one that I’ve found useful, it should work for you too.